I realize this is my second post in a row that includes an elephant and a circus, but that is purely by chance. No subliminal theme here. :) A follow-up to the famous Caps for Sale, I actually like this story better than the first. The cap peddler finds himself transformed into a circus act after a parade mishap involving an elephant and a herd of acrobats. 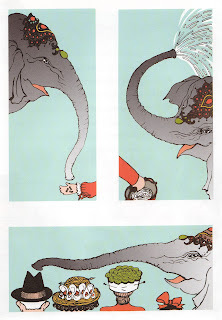 The illustrations of the circus folk and animals are whimsical and have a really cool flow. My son goes ape for the little poodle in the French sailor's costume and loves the tumbling girls with their legs twisted in every direction. he reached for it with his long trunk. a very amused crowd, and a very, very sad peddler. came flying down in every direction. Allan Sherman's Hello Mudduh, Hello Fadduh!